The chief danger in life is that we take too many precautions. We are on this Earth but for a minute. Live your life in your vision - not in the vision of others. You never know how fearless you are until someone you love is in danger. When you love yourself more than anyone else ever could, that's dangerous. Love is dangerous, as much or more, as love is beautiful. And to those who believe that adventures are dangerous, I say try routine: it kills you far more quickly. Fear is not real, it is a product of thoughts you create. Now do not misunderstand me, danger is very real, but fear is a choice. Sticking your head in the sand might make you feel safer, but it's not going to protect you from the coming storm. My eyes see the danger; my heart knows the outcome, but my mind decided to take the risk. Weakness; takes over. Danger is the possibility of experiencing anything unpleasant or harmful. One should always be vigilant and alert so as to ward off any imminent danger. Dangerous and harmful substances like cigarette, liquor, drugs etc should not be consumed. Such substances are fatal to human health and can have bad repercussions on one’s health. All of us fear danger and dangerous circumstances. Sign boards are put up at places where there is any danger or risk to human life. 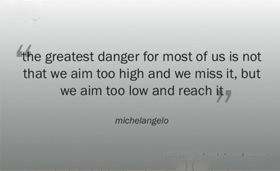 In the words of Michael Angelo “The greatest danger for all of us lies not in setting our aims too high.” To be successful in life, it is very important to be ambitious and focussed towards your goals. Your ambitions should be sky high. Under achievers basically lag behind high achievers, because of their paltry and mediocre aims. This is the essence of this quote by Michael Angelo.